Morgan James Publishing, 9781683501879, 168pp. This is another book in the trademarked "Revolutionize" series, which targets the corporate and executive segment of our society and offers valuable tools and advice on achieving personal and professional excellence. Revolutionize Your Corporate Life is divided into ten unique chapters, each addressing an important topic to achieve the healthy balance between your personal and corporate environment. This is not your typical corporate 'self-help' publication. It offers other topics to improve broad aspects of your life, which can be incorporated into your business and management world. Using the tools outlined in Revolutionize Your Corporate Life you can effectively manage time and stress, which will allow you to be more effective and propel your business to new heights. Peggy Caruso is a certified Executive & Personal Development Coach, Author, and 8-time entrepreneur with 24 years experience. Her 'Revolutionize' series has been approved as a registered trademark and inclusive of that are her previous books, "Revolutionize Your Life" and "Revolutionize Your Child's Life." 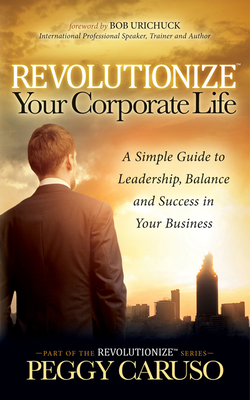 Her current book, "Revolutionize Your Corporate Life" is a resource guide for anyone in the corporate arena. Peggy has been interviewed by 50+ radio stations across the US & Canada. She has also been interviewed by TV stations- NBC Atlanta and Co. and the local channel WICU 12 Erie, PA.